Video clip synopsis – Ten hand-written rules displayed in a museum in the heart of the National Heritage-listed Melbourne Cricket Ground hold the key to a great Australian sport. Broadband MP4 afl_bb.mp4 (18.2MB), suitable for iPods and computer downloads. 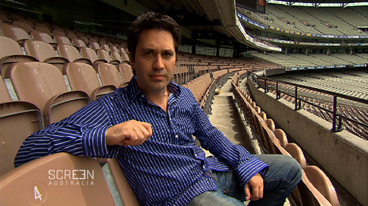 Rules of AFL is an episode from the series Australia’s Heritage – National Treasures with Chris Taylor, produced in 2009. The history of the beginnings of Australian Rules football is intertwined with the development of cricket in the colony of mid 19th century Victoria. The Melbourne Cricket Club (MCC) was the first cricket club in Victoria, formed in 1838. The Melbourne Cricket Ground (MCG) was later established in 1853 when Lieutenant-Governor La Trobe provided 10 acres of land in Yarra Park to the MCC. Originally the Wurundjeri-willam, a clan of the Woiworung and part of the Kulin nation, lived in this area. Historical records indicate many large gatherings of Aborigines in the area during the 1830s and 1840s. In 1858 Tom Wills and other members of the MCC devised the first ten rules of the Melbourne Football Club, which became the first codified rules of Australian Rules football. It has been claimed, but not proven, that in inventing Australian Rules, Wills was influenced by an Aboriginal game called Marn Grook (also known as Marngrook), which he had observed and played when a boy while living in Victoria’s Western District. Australian Rules was played on the MCG for the first time in 1859, a winter game devised for utilising the shape of existing local parks and cricket ovals, unlike the other football sports of rugby and soccer, played on rectangular pitches. Initially, though, a soccer ball was used, but later a spheroid rugby ball was preferred. Since the late nineteenth century the MCG has been the symbolic home of football, first in Victoria, where the Victorian Football League (VFL) was formed in 1896 and, with the establishment of the Australian Football League (AFL) in 1990, in Australia as a whole. The rules of football have altered and considerably expanded since 1858, and are constantly being modified. Who was the man primarily known for devising Australian Rules football? In what year were the first rules of the sport written, and where is the original document of these rules now kept? Explain why the sport of Australian Rules football was invented. Explain why the Melbourne Cricket Ground (MCG) has, in the words of the program, always been the ‘spiritual home’ of Australian Rules. British winter sports such as rugby and soccer were already played in Melbourne when Australian Rules football was invented. Carry out research then write a commentary on why Australian Rules developed quickly during the later decades of the 19th century in Melbourne, whereas soccer and particularly rugby, which was popular in Sydney, did not develop. Include a commentary on the history of the type of ball used in Australian Rules in the 19th century, and the reasons for the decision to alter this.